Alright, I think I can for sure recite the specials. Of course I didn’t write them down (or take a picture). So I’m going to wing it. I think Mondays are spaghetti, Tuesdays fettuccini alfredo, Wednesdays fried chicken, Thursdays are chicken fried steak, Fridays I think are catfish, Saturdays I believe are a second fried chicken night and maybe prime rib? Or maybe Sundays are prime rib? I know there’s a prime rib day. 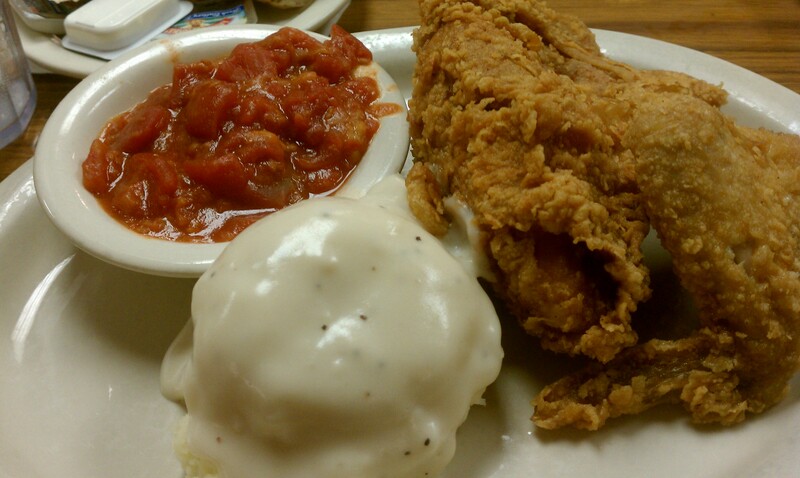 I have it on good accord that chicken fried steak is awesome. I personally can’t imagine eating unlimited alfredo sauce, but once we get into this review, you’ll find out I only had one round anyway. So if that’s the case, I could do any of these days at least once. Most of the meals are between $6 and $7, except for the prime rib. Which if I remember right, there were two options for that, “King” and “Queen.” Not sure what the difference is. Or if maybe prime rib isn’t all you can eat? Apparently I need to go back. They also have a regular menu you can eat off of. And desserts, including pie and cobbler. YUM! Anyway, the meats come with salad, veggie, potato and bread. The pastas with salad and bread. So keep that in mind. But intead of talking what you CAN do, let’s talk about what we do do… Did do. I was trying to quote Friends. Fail. So, Faye and I ordered the all you can eat chicken. Josh got a bacon cheeseburger. How often does a dude get out-eaten by two girls? Well, it’s about to happen! 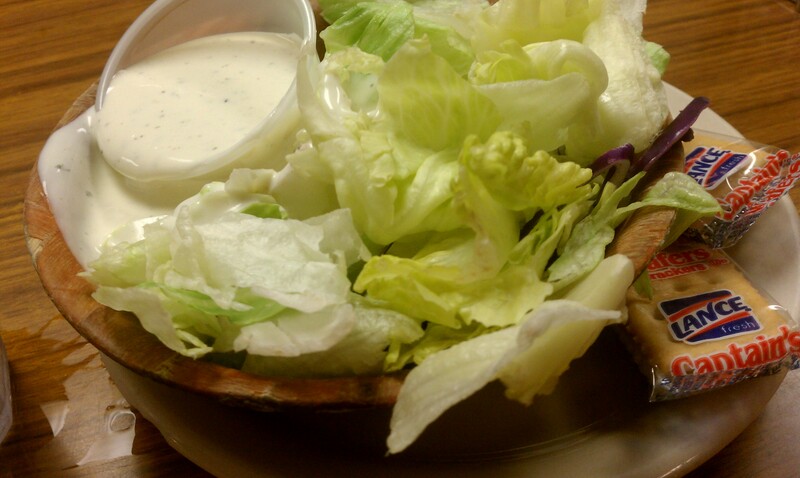 The salad was very simple (read: mostly lettuce with those crackers that come with salads). The ranch was homemade, though. Point Fat Ernie. The vegetable choice was cream corn or breaded tomatoes. I know I don’t like cream corn. And wasn’t sure what breaded tomatoes are (note: I don’t like them either, and I’m still not totally sure what they are). When I asked what kind of potatoes you get, I got a list of about fifty. Some I remember are baked, mashed, and French fries. But I know there were more than that. 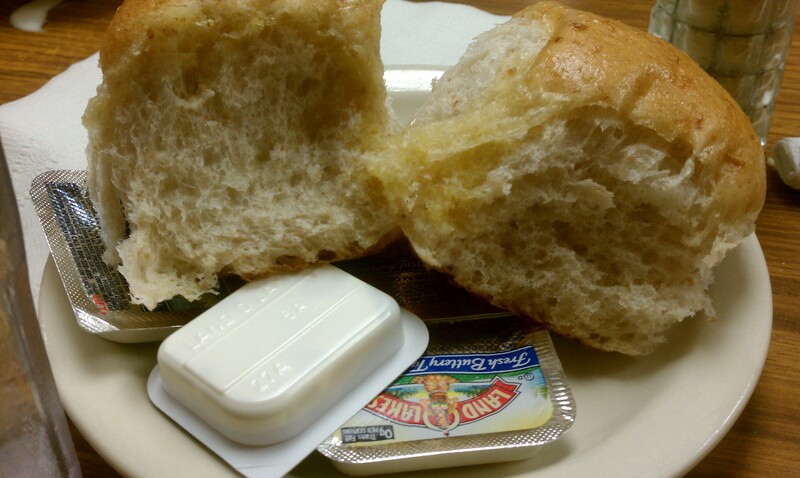 And the bread that came out almost looked wheat, but Faye said normally the bread is different. Hey, bread is bread. I’ll eat it! And… We saw someone eating mac and cheese. If you’ve met me, you know I love all things cheese. So we asked to do mac and cheese as a side instead of refilling the veggies (note: I’m not sure whether or not we paid for the side of mac and cheese). Now, I’m NOT a fried chicken connisseur. Dad ate fried chicken all the time growing up, so he NEVER wanted it for dinner. Then he had bypass surgery which meant anything fried was off our family dinner plan. This is OK because I also never crave fried chicken. All that aside, I know what tastes good. And this chicken was good. I opted for white meat. Faye got white and dark. And let me tell you, they aren’t skimpy with all you can eat. Some places you have to ask for more, and even then they look at you like you aren’t going to be able to eat what you’re getting (reference the bad taste still in my mouth from The Biggest Cheese). In fact, I think our waitress appreciated the value of time when considering how much you can pack in before getting full. She was asking if we wanted more long before we were done. If you’re going to do all you can eat, you have to do it right, really extend the offer to your patrons. And Fat Ernie’s does this better than anyplace I’ve been. Kudos! And all with good food and friendly service. Double thumbs up. All this talk about chicken and shoveling in food, I forgot to talk about Josh’s bacon cheeseburger. He said the burger was good, and the bacon was perfect. He said either the bacon’s dry or greasy and chewy. But he said it was perfectly done. And the fries are homemade. Score! Faye and Josh shared a piece of chocolate cake and a glass of milk. I believe the cake was so good it altered the way Faye sees life. All in all, it was a great trip. The inside of the restaurant isn’t anything fancy. Which I didn’t even notice until a friend of mine commented on it after I told her I’d gone there. She said she’d heard a lot about Fat Ernie’s then walked in and didn’t see what the hype was about. But, that said, decor is decor. I personally felt like I was in “the cafe” my dad’s brothers always talk about in his hometown. I’ve never been there. But as I ate chicken in this diner-like atmosphere with a really friendly waitress who acted like she’d known us since we slithered out of the womb, I couldn’t help but think this is how I imagined “the cafe.” Only “the cafe” would have been a LOT smaller. Overall, I’d say GO! Is it the best chicken? Like I said, I’m not an expert, but I REALLY liked it. The mac and cheese tasted like my mom’s, and I imagine the meal as a whole wasn’t far off from what Dad ate on “the farm” growing up. Hey, old fashioned comforts, right? It was like being in a simpler time. And the cake was apparently orgasmic. What more could you want? The salad’s nothing fancy. But homemade ranch dressing makes anything special! If I had to pick a complaint, it was their vegetable choices that night. I’m sure lots of people liked them, but for me, personally, that’s the only thing I wasn’t blown away by. 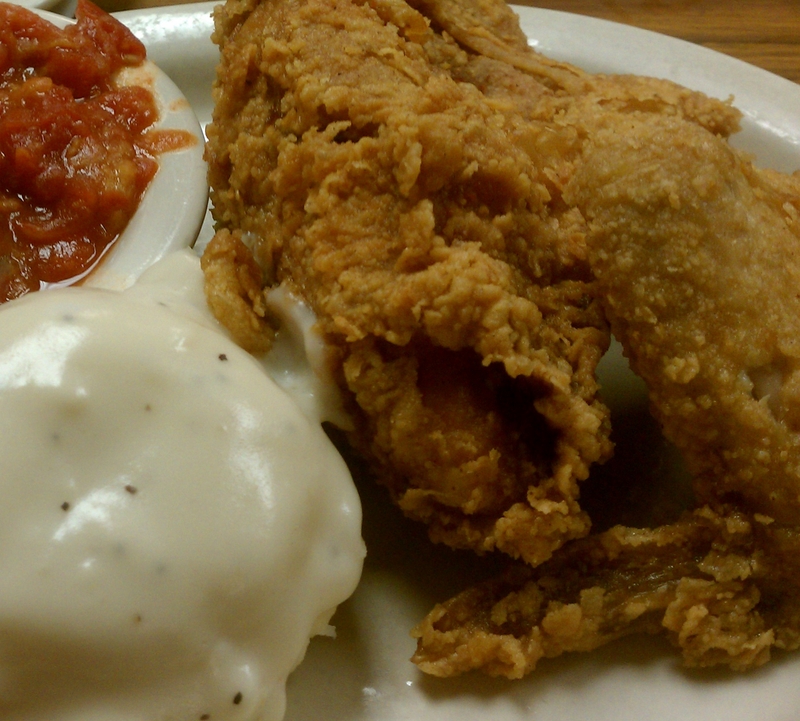 But the mashed potatoes, gravy and chicken were all perfect, hot and served up like Mom would (in generous portions). Who doesn’t like a little bread with her meal? The mac and cheese more than made up for the breaded tomatoes. Seriously, more than. Yummy! 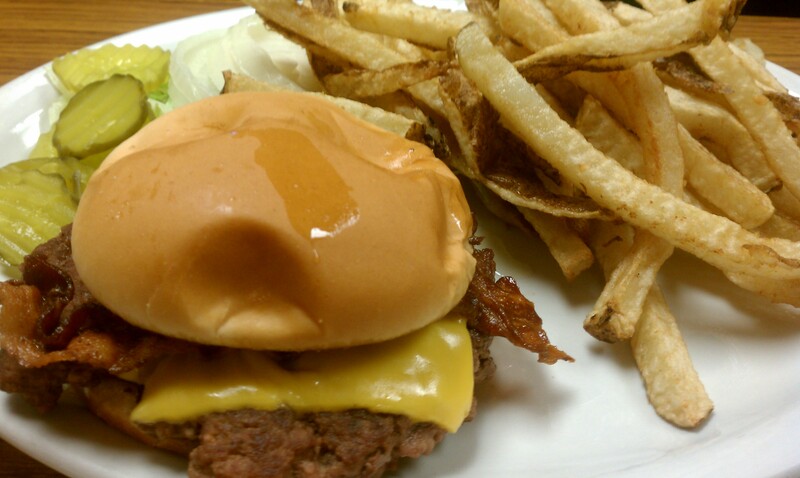 And Josh’s cheeseburger, which got hardly any airtime this review. But it looks delicious, no? He’s lucky we’re not closer friends, or I totally would have demanded a bite! I,ve been eating at Fat Ernie’s for years and I think that it is the best deal around for fill-you-up down-to-earth awesome food. I don’t think that there isn’t a special that I haven’t tried. There breakfast is wonderful as well. Now I’m jonesing for Ernie’s; I might take my wife and son out tonite!!! BTW I love your site!! Thanks, Bobby! I agree, their service is down to earth, and awesome. And the food is delicious and an awesome value. I love how the servers dont’ make you feel bad for taking advantage of the all you can eat that you’re eating. In other words, they don’t guilt you into not getting seconds (or thirds or whatever). You’re paying for all you can eat, after all! So did you end up going? What did you get? I wish my waistline would let me go there more often! This sounds like a place I need to put on my “to do” list!